Film @ Droichead was delighted to launch its new programme last night. Last night’s free event was the kick-off of a new season of 9 high quality art-house films. With a huge turn-out, an incredible documentary on show and a highly interesting Q&A afterwards, we had the perfect ingredients for a successful Tuesday evening. Did you miss last night’s launch? No bother, keep on reading because you can still book single and seasonal tickets. Do you enjoy watching a good film? Do you want to break the habit of spending week nights at home or in front of the television? Would you be willing to trade in the couch for a modern cosy cinema seat to enjoy a pocket friendly night out? Keep on reading, because Film @ Droichead is exactly what you are looking for. Oh and don’t forget to bring a friend, because… this is what you do with friends. 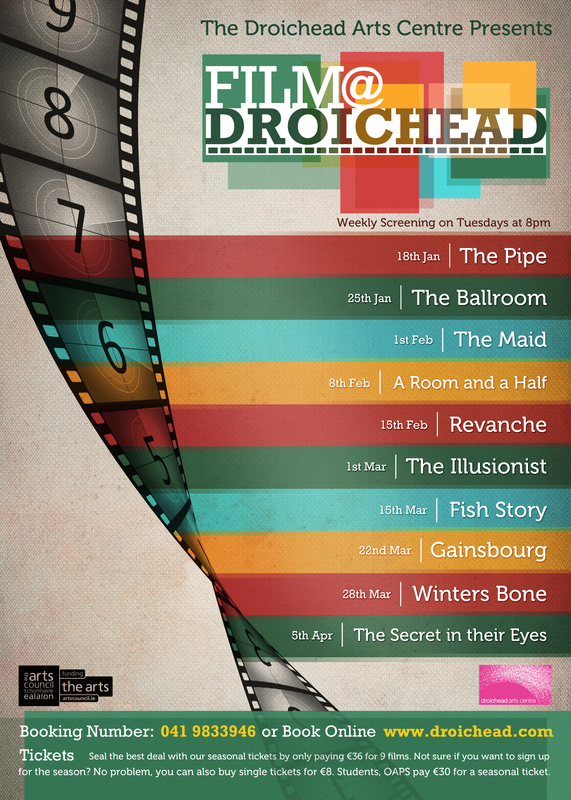 Film @ Droichead is our weekly digital film programme, presented in collaboration with Access Cinema. This partnership allows us to screen a fantastic mix of high quality cinema from around the world. Film @ Droichead presents a diverse programme of international films including an assortment of classic, foreign-language, art-house and independent cinema. Film @ Droichead gives local audiences the opportunity to see a range of cultural films that rarely make it to commercial cinema for very reasonable prices. Seal the best deal with our seasonal tickets by only paying 36€ for 9 films. Not sure if you want to sign up for the season? No problem, you can also buy single tickets for 8€. The films are shown on a large digital screen in the comfort of a modern cosy theatre with 162 seats. We run a weekly screening on Tuesday at 8pm. Click here to find the synopsis of all the films. This entry was posted on January 19, 2011 at 11:38 am and is filed under Uncategorized. You can follow any responses to this entry through the RSS 2.0 feed. You can leave a response, or trackback from your own site.